Mouse monoclonal PLK1 antibody [35-206]. Validated in WB, IP, IHC, ICC, Flow Cyt, ICC/IF and tested in Mouse, Rat, Human. Cited in 21 publication(s). Independently reviewed in 5 review(s). His-PLK1 full length purified from Sf9 cells. Our Abpromise guarantee covers the use of ab17056 in the following tested applications. WB Use a concentration of 1 µg/ml. Detects a band of approximately 66 kDa (predicted molecular weight: 67 kDa). This clone is superior to clone 36-298 (ab17057) in Western blotting and IP, but suffers from high background in IF and ICC. Serine/threonine-protein kinase that performs several important functions throughout M phase of the cell cycle, including the regulation of centrosome maturation and spindle assembly, the removal of cohesins from chromosome arms, the inactivation of APC/C inhibitors, and the regulation of mitotic exit and cytokinesis. Required for recovery after DNA damage checkpoint and entry into mitosis. Required for kinetochore localization of BUB1B. Phosphorylates SGOL1. Required for spindle pole localization of isoform 3 of SGOL1 and plays a role in regulating its centriole cohesion function. Phosphorylates BORA, and thereby promotes the degradation of BORA. Contributes to the regulation of AURKA function. Regulates TP53 stability through phosphorylation of TOPORS. Belongs to the protein kinase superfamily. Ser/Thr protein kinase family. CDC5/Polo subfamily. Contains 2 POLO box domains. Accumulates to a maximum during the G2 and M phases, declines to a nearly undetectable level following mitosis and throughout G1 phase, and then begins to accumulate again during S phase. Catalytic activity is enhanced by phosphorylation of Thr-210. 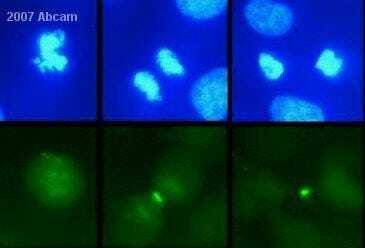 Phosphorylation at Thr-210 is first detected on centrosomes in the G2 phase of the cell cycle, peaks in prometaphase and gradually disappears from centrosomes during anaphase. Autophosphorylation and phosphorylation of Ser-137 may not be significant for the activation of PLK1 during mitosis, but may enhance catalytic activity during recovery after DNA damage checkpoint. Ubiquitinated by the anaphase promoting complex/cyclosome (APC/C) in anaphase and following DNA damage, leading to its degradation by the proteasome. Ubiquitination is mediated via its interaction with FZR1/CDH1. Ubiquitination and subsequent degradation prevents entry into mitosis and is essential to maintain an efficient G2 DNA damage checkpoint. Nucleus. Chromosome > centromere > kinetochore. Cytoplasm > cytoskeleton > centrosome. During early stages of mitosis, the phosphorylated form is detected on centrosomes and kinetochores. Localizes to the outer kinetochore. Presence of SGOL1 and interaction with the phosphorylated form of BUB1 is required for the kinetochore localization. Immunofluoresence using ab17056 and either U2OS, HeLaS3 or NIH 3T3 cells. Plk1 can be seen localising with MKLP in the U2OS cell and with Cdc20 in the HeLaS3 and NIH 3T3 cells shown. Observed band size: 66 kDa why is the actual band size different from the predicted? 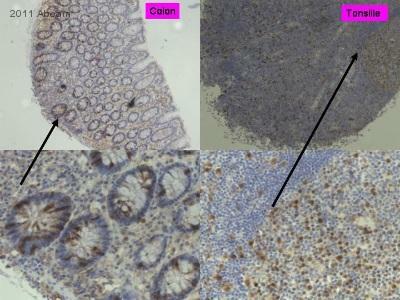 ab17056 at 1/100 staining human kidney tubular epithelial cells by ICC/IF. The cells were formaldehyde fixed, permeabilized with Triton X-100 and blocked with goat serum before incuabtion with the antibody. A goat anti-mouse FITC antibody was used as the secondary. Overlay histogram showing HCT116 cells stained with ab17056 (red line). The cells were fixed with 4% paraformaldehyde (10 min) and then permeabilized with 0.1% PBS-Tween for 20 min. 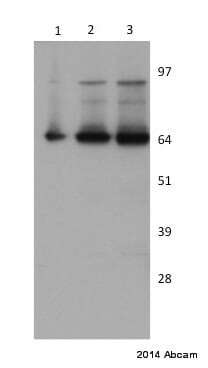 The cells were then incubated in 1x PBS / 10% normal goat serum / 0.3M glycine to block non-specific protein-protein interactions followed by the antibody (ab17056, 1µg/1x106 cells) for 30 min at 22ºC. The secondary antibody used was DyLight® 488 goat anti-mouse IgG (H+L) (ab96879) at 1/500 dilution for 30 min at 22ºC. Isotype control antibody (black line) was mouse IgG2b [PLPV219] (ab91366, 2µg/1x106 cells) used under the same conditions. Acquisition of >5,000 events was performed. This antibody gave a positive signal in HCT116 cells fixed with 80% methanol (5 min)/permeabilized with 0.1% PBS-Tween for 20 min used under the same conditions. Publishing research using ab17056? Please let us know so that we can cite the reference in this datasheet.